The first promotional image from The Emoji Movie, featuring its trio of heroes: Jailbreak, Gene, and Hi-5. CinemaTech is Eric Emin Wood’s periodic look at how pop culture depicts the world of tech. The Emoji Movie currently enjoys a seven per cent “freshness” rating on review aggregator Rotten Tomatoes, with a critical consensus of  and an average rating of 2.5 out 10. In other words, only seven reviewers out of 87 gave it the equivalent of six or more out of 10, with the “fresh” reviews featuring such ringing endorsements as “Positive messages, but colorful adventure is only ‘meh’” (Common Sense Media’s Betsy Bozdech), and “As animated children’s films go, this one’s pretty okay” (John Byrne, Ireland’s RTÉ). You also probably don’t need me to tell you that for Sony, The Emoji Movie represented a marketing bonanza – an unprecedented opportunity to build a lucrative franchise based on intellectual property in the public domain, with countless opportunities for advertising partnerships. After all, when the emojis tire of – or in Gene’s case, need to escape – their native messaging app, rendered in The Emoji Movie as a digital city, where do they go? Other apps, of course – including Facebook, Candy Crush, Just Dance, and… Dropbox? …Yes, Dropbox – and, the movie constantly reminds us, its signature airtight, firewall-based security – apparently paid Sony enough to become the destination in Gene’s adventure. More on that below. Yet what astonishes me the most about The Emoji Movie is not the cynical concept, off-putting character designs, or crass product placement that forms the spine of the movie. Bright, colourful, fast-paced, with the usual family-friendly lip service about encouraging viewers to be themselves – and relentlessly boring. 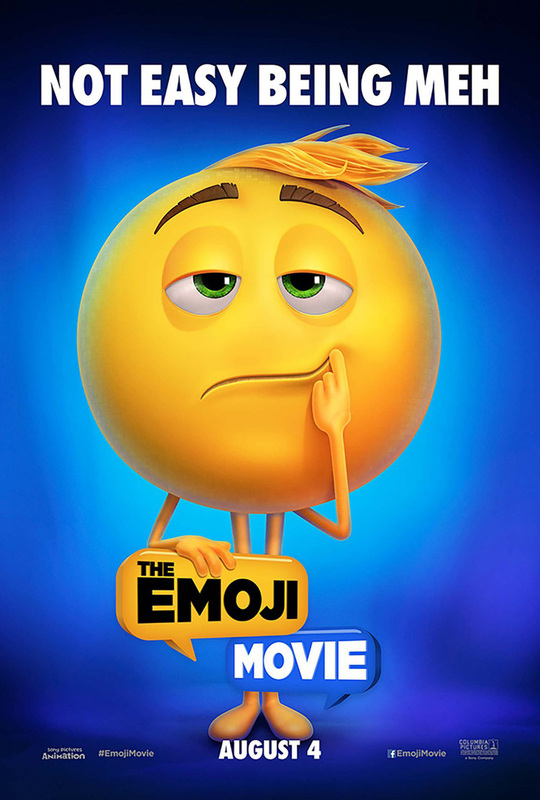 A film in which the studio’s marketing department clearly played such an outsize role in both its development and release (however dire the final product, Sony made sure viewers knew The Emoji Movie was coming out), and which has – it must be admitted – such familiar, engaging, and addictive subject matter to work with should not be as boring as The Emoji Movie. When the film begins our protagonist (voiced by Silicon Valley’s T.J. Miller) faces a problem. Despite being a “meh” emoji – and in the world of The Emoji Movie, emojis can only express one mood, which they maintain for the sole purpose of being photographed while standing in a gigantic Hollywood Squares-like set before having their mugshots beamed onto our smartphone screens – he can somehow experience multiple emotions. And in the faux-happy dystopian operation run by the number-one emoji, Smiler (Maya Rudolph), that simply will not do. You can tell Smiler’s evil. Nobody’s that happy all the time. Gene himself feels terrible about his condition and, with help from his friend (I think? The movie calls him a friend, but he sure doesn’t act like one) Hi-5 (James Corden), seeks out princess emoji-turned-hacker Jailbreak (Anna Faris) and asks her to reprogram him. To be reprogrammed, Jailbreak says, Gene needs to leave the phone. To do that, he needs to reach the cloud. To reach the cloud, he needs to reach Dropbox. To reach Dropbox, he needs to pass through… you see where this is going. Before watching The Emoji Movie, I read multiple reviews describing it as soul-crushingly awful, though writeups from Vox’s Alissa Wilkinson, who called it “a garbage fire,” and Indiewire’s David Ehrlich, who called it “almost as bad and brutally depressing as everything else in 2017,” only served to convince me that I needed to write about it for this column. I knew about Gene’s journey, that the movie ripped off elements of Inside Out and Wreck-It Ralph (like the latter’s princess-turned-glitch, Jailbreak’s lineage is supposed to be secret, but it’s neither well-hidden nor creatively revealed), and that its product placement included Facebook, Candy Crush, Just Dance (which I hadn’t known was available as an app before the film, so kudos to UbiSoft, I guess? ), Spotify, and Dropbox – everything you’d expect except Netflix, since it’s a competitor to Sony’s own streaming service, Crackle. What I didn’t expect was how utterly unimaginative it turned out to be. The Candy Crush and Just Dance segments are just that – games of Just Dance and Candy Crush. None of the characters that populate Candy Crush’s world appear, and Just Dance doesn’t appear to have any residents except a spirited instructor, Akiko Glitter (Christina Aguilera), who during the movie is unfairly banished to Alex’s trash and doesn’t appear to escape. I thought this would be one moment, not the entire five-minute scene. YouTube is nothing more than a line of screens dominated by “Pen Pineapple Apple Pen” – and a kitten video. And instead of Facebook being a world Gene and co. visit it’s a throwaway gag, with Hi-5 remarking “Who needs friends? What you need are brands. They give you complete and unrelenting support!” while walking past what appears to be a Facebook-branded building filled with gossiping human-shaped shadows. The filmmaker’s depictions of Spotify and Instagram come closest to matching the creativity that might have resulted from this project, turning the former into a literal (but still perfunctory) stream of music and the latter into a series of three-dimensional vacation photos for Gene’s parents to get lost in while they search for their son (in case you didn’t notice, the movie has a lot of threads, none of them good). But for the most part The Emoji Movie depicts its partners’ apps in the laziest manner possible, and as a result tends to elicit not the joy and laughter Sony’s marketers probably imagined, but the type of mental wanderlust that led Ehrlich to compare it to the Donald Trump administration and me to vow never to download the Just Dance or Dropbox apps out of spite. Dropbox doesn’t even work properly on-screen. Before Gene, Jailbreak, and Hi-5 are nearly caught by Smiler’s viruses and saved by the Twitter bird, our princess-turned-hacker repeatedly enters the wrong password – burning Gene to a crisp with each attempt – at least 15 times. The real Dropbox would have locked her out. Just like theatres should on anyone else who tries to see this movie.